Here’s a nice shot of a Schmid valve cluster and a bell flare with nickel silver garland. The ports between the valves have a gentle curve and there are no solder joints to interfere with the airflow. Schmid’s garland is narrower than most and has an oak-leaf motif. Garlands can also be made in yellow or gold brass. Engelbert Schmid horns has just launched a new website: www.engelbert-schmid-horns.com (Easy to remember, harder to type.) It’s been completely redesigned and organized and has a lot of information and pictures. It shows the full range od Schmid modern horns, baroque and classical hand horns, and Wagner tubas. Our next Schmid horn is due in late January. It’s a full double, yellow brass, lacquer, two water keys, adjustable hand rest, and your choice of bell flare. (All our Schmid horns come with detachable bell.) Give us a call (978-823-0580) or an email if you’re interested. 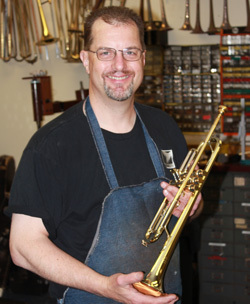 We’re pleased to welcome Ed Shenk as our newest Engelbert Schmid horn owner. Ed’s retired from an engineering career at Polaroid. He currently plays in local amateur ensembles and in a horn quartet. I know the horn will get a lot of good use! Ed’s passion though, is resurrecting classic horn quartet music. He’s transcribed, edited, and published all 136 of the Gumbert quartets as well as others by Dauprat and Javault and various duets and trios. Ed’s Mute Crib holds two mutes and folds flat . Interestingly, he’s transposed everything into F and includes an alternate fourth part for euphonium. He also makes a gadget called a “Mute Crib” that holds two mutes within easy reach . All the music is available on his website: at http://www.cadtronix.com. Be sure to check it out.